It should come as no surprise that people are creatures of habit. For the most part, we follow the same morning routine, take the same route to and from work, and watch the same shows on a given day. This idea also holds true when it comes to dining out. Once we find a restaurant we like, it usually becomes the new “go-to” spot. Over time, though, just about any food joint grows stale. Duh, right? Whether you’re planning a mid-week meeting with an important client or you’re taking the whole family out for lunch on the weekend, you expect your lunch to be exceptional. Your first time at a new lunch spot, don’t be afraid to ask the staff what they recommend. This allows you to try the restaurant’s specialty and possibly avoid getting the wrong dish. If for whatever reason you aren’t satisfied with what you ordered, then it’s on to the next restaurant on your list. This is especially important if your lunch outings are group occasions more often than not. Sure, you could ask people ahead of time what they like and don’t like. Frankly, though, you’re better off just going somewhere that has options for various tastes. At Wild Flower Restaurant, for example, our lunch choices include everything from soups and salads to sandwiches and pastas. We’ve all been to restaurants where the service is terrible. Unfortunately, poor service from the manager and/or wait staff can ruin even a good meal. So as you make your way around St. Louis trying to find your new favorite lunch spot, pay attention to how you and your group are treated. We’re guessing you won’t put up with less than satisfactory service for long. Who says that enjoying a lunch out means having to break the bank? 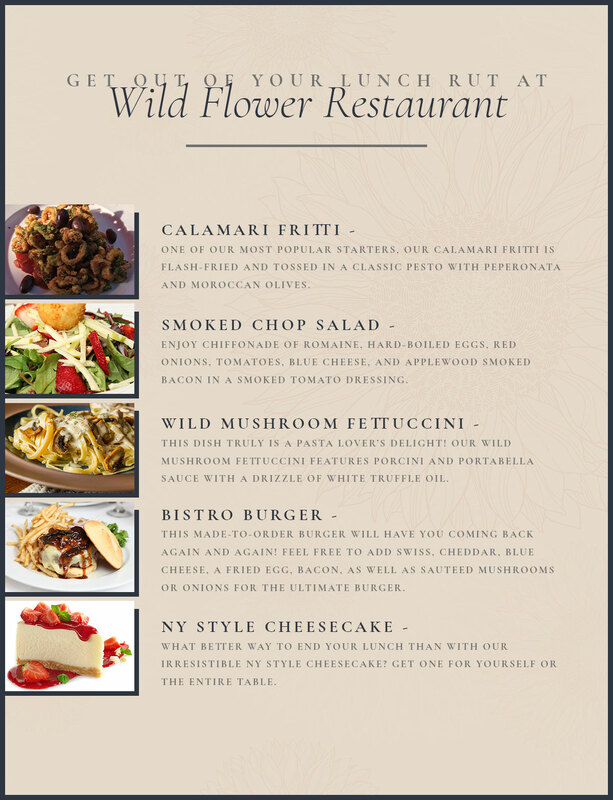 At Wild Flower Restaurant, the majority of our midday dishes are less than $15. Our famous Chicken Salad Wrap, for example, is just $11 and comes with chicken, grapes, walnuts, lettuce, and mayo. Don’t make the mistake of thinking you have to overspend just to have a nice lunch. This is another important consideration. For most of us, lunch needs to be a fairly quick meal so we can get back to work, school, or other responsibilities. That said, it doesn’t make much sense to go somewhere that’s completely out of the way. 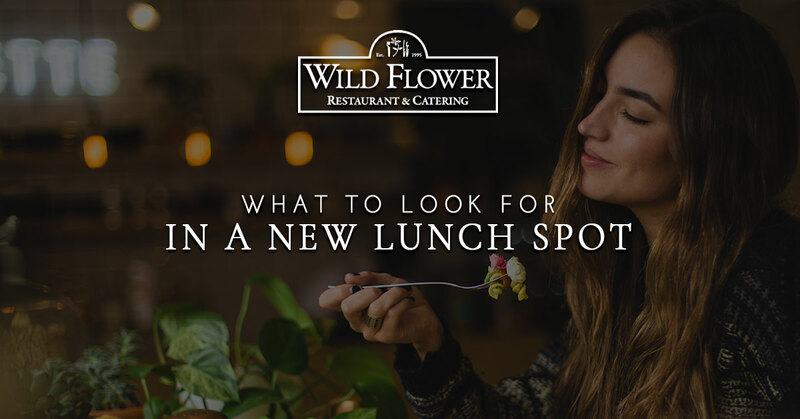 When it comes to centrally located lunch places in St. Louis, you can’t beat Wild Flower Restaurant. Check us out the next time you’re in the Central West End — you can’t miss us! We hope you’re open to making Wild Flower Restaurant your new go-to lunch spot in St. Louis! Take a look at our award-winning lunch menu and join us from 11 a.m. to 4 p.m.
Give The Gift of Great Food - Gift Certificates on Sale Now!